In 1976, in India’s Punjab region, 18-year-old Sunil Bharti Mittal (OPM 27, 1999) borrowed a modest sum from his father and founded a business making crankshafts for local bike manufacturers. He first dialed in to telecom in 1983 when, on a trip to Taiwan, he saw the popularity of electronic, push-button phones. At the time, India had tough restrictions on importing consumer products, so Mittal brought in component parts and built and sold his own phones. In 1992, after reforms by India’s government improved the country’s business climate, he formed a consortium that included SFR-France, Emtel-Mauritius, and MSI-UK and bid successfully for one of four mobile-phone network licenses auctioned by the government. 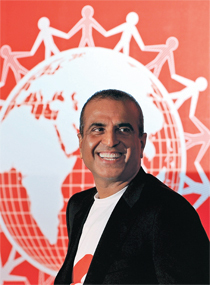 Three years later, Bharti Airtel launched mobile services in Delhi and in time became India’s largest telecom company. Then, looking overseas for new markets, Mittal decided on Africa, where mobile penetration is still only about 40 percent, and 60 percent of the continent’s 1 billion people are under 25. In 2010, for an enterprise valuation of US$10.7 billion, Bharti purchased from Zain, a Kuwaiti firm, its mobile operations in 16 African nations. “It would have taken us years to achieve Zain’s scale,” Mittal explains. “Furthermore, our business model fit beautifully, and the only other major challenge was that of cultural integration.” Within two years of buying out Zain, operating in Africa as Airtel, Bharti has added more than 14 million new mobile customers (for a current total exceeding 50 million), while investing approximately US$1 billion in network infrastructure. This low-cost model helps Bharti reduce operating costs and pass savings on to customers. With aggressive rollout and marketing, this approach has helped make India the second-largest mobile market in the world, with the lowest tariffs globally, a model that has been adopted elsewhere internationally, Mittal notes. Looking ahead, by diversifying into emerging business areas in India’s booming economy, Bharti’s goal is to become “India’s finest conglomerate” by 2020. Meanwhile, in Africa, consumer spending is estimated to reach US$1.4 trillion by that date. Maybe that global big picture is another good reason why the irrepressible Mittal is smiling these days.